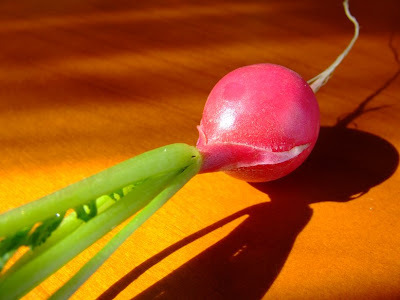 First wee radish, so young, so tender, so ready to be devoured by me, NOM NOM NOM! Radish are super easy to grow, I bought a packet of mixed radish seed, so I never know what kind I'm going to pull out of the ground, this one looks like traditional radish though. My lettuces and spinach are taking FOREVER to grow, I'm sure I planted them months ago. knowing my attention span it was probably only just last week.